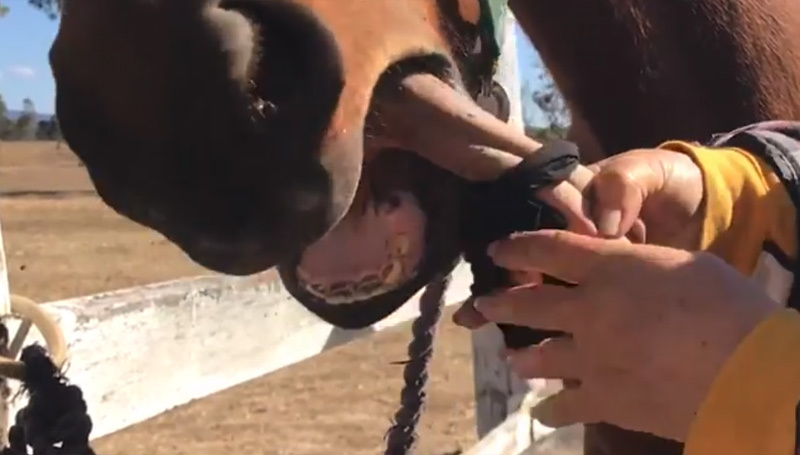 Researchers Samantha Franklin, of the University of Adelaide and Paul McGreevy, of the University of Sydney, discuss the use of tongue ties in horses. The use of widespread use of tongue-ties in horse racing in Australia has recently come under fire. Proponents of the tongue-tie – a strap that immobilises a horse’s tongue – argue that it prevents breathing issues during races, increasing performance and improves the rider’s control of the horse. But there are limited data to show that tongue-ties improve racing speeds overall, and there’s mounting evidence that they can cause stress and injury. Tongue-ties are banned in most non-racing equestrian sports in Australia, and Germany recently banned them altogether. A tongue-tie is a strap that immobilises a horse’s tongue by attaching it to the lower jaw (and sometimes to the bit in the horse’s mouth). The straps may be fashioned from nylon stockings, elastic bands or leather. Tongue-ties date back to the 18th century. Early reports suggest that they were used to prevent abnormal noise and airway obstruction, caused by the horse pulling back its tongue and forcing its soft palate backwards. In lay terms, many refer to the horse that does this as having “swallowed its tongue” or “choked down”. In recent years, endoscopy has confirmed that displacement of the soft palate during exercise can obstruct a horses’ airway and limit oxygenation, reducing athletic performance. Exactly how tongue-ties prevent this is unclear, but it is believed that tying the tongue forward may prevent retraction of the tongue and larynx and help to stabilise the upper airway. However it’s far from certain the tongue-ties are effective. A recent study found they did not prevent displacement in more than 70% of affected horses. Furthermore, there are many causes of respiratory noise in horses, and there is no rationale for the use of a tongue-tie for these other conditions. As well as potentially preventing upper airway obstruction, tongue-ties may stop horses from getting their tongue over the bit, increasing the rider’s control. In both Thoroughbred and harness racing, their use is widespread. Horses racing with tongue-ties are specified on the race-card, so the scale of their use can be estimated from these data. This can be compared to the 5% of starters reported to wear a tongue-tie in the UK. Data from all Thoroughbred races in Australia between 2009 and 2013 show that 72% of trainers used a tongue-tie on at least one horse over the 5-year period. Similarly, a survey of 535 Standardbred trainers found that 85% used tongue-ties on one or more horses during training or racing. Using relentless pressure to modify a horse’s behaviour is against the principles of ethical training. In a recent survey, 23% of Australian Standardbred trainers reported problems associated with tongue-ties, including lacerations, bruising and swelling of the tongue, difficulty swallowing, and behaviour indicating stress. Compared to the sham treatment, there was more head-tossing, backwards ear position and gaping during tongue-tie application. Horses with previous experience of tongue-ties showed more head-tossing and mouth-gaping, suggesting that horses did not simply get used to the intervention. Above: A video recorded for demonstration purposes by Horses & People Magazine. During the recovery phase, lip-licking was more frequent after tongue-tie application than after sham treatment, suggesting that after their tongues are restrained horses are highly motivated to move them. Salivary cortisol concentrations increased after tongue-tie application, indicating a physiological stress response. These potential problems prompted a recent international equine welfare workshop on various common veterinary and management practises to score tongue-ties as having a “profound transient impact”. The industry needs to address two separate issues. Firstly, if tongue-ties are being used to address upper airway obstruction then a veterinary diagnosis should be required. There are many causes of breathing noise that are unrelated to palatal issues, and which would not be helped by a tongue-tie. Secondly, there is the issue of control. If one argues that tongue-ties are needed for safety because they stop the tongue travelling over the bit, then theoretically one is obliged to use them for all horses – since all horses have the capacity to adopt this evasion. We need better research to understand exactly how tongue-ties help or harm horses. Given that other equestrian sports are conducted without tongue-ties, many would argue that racing should be as well. We have always disliked ties! To become a trainer of race horses in our state one must demonstrate proficiency. Because of this requirement we decided not to take the trainers test. We felt the use of ties is cruel and unneeded as well as hazardous to both horses and handlers upon the removal of the tie later.